On yet another calm cool morning in the San Bernardino mountains of Southern California, nearly twice as many racers lined up for the second annual NUE Big Bear Grizzly 100. The course received its inspiration from the infamous Terrible 10,000, a ride the local endurance hammerheads have been doing for years. 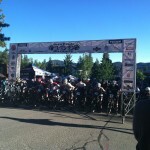 This year’s race featured several shorter distances and some non-competitive rides in addition to the NUE Grizzly 100. 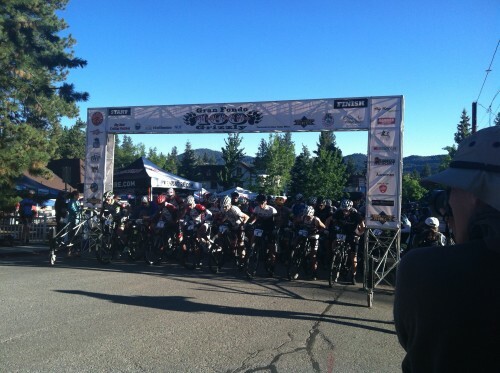 The race kicked off a week-long cycling festival organized by Bear Valley Bikes. Located at 7000 feet above sea level, the charming tourist town of Big Bear has long had a solid reputation as a cycling destination, attracting visitors from the LA Valley and hosting some of the largest national events over many years. Nearby ski resorts offer lifts for cyclists during the summer months accessing the newly developed Skyliner Trail. This year’s race doubled in size with participants coming from 11 different states and several countries including Mexico, Brazil, Hong Kong, Slovenia, Canada, and France. Specialized Bikes and Lauf Forks offered demo’s throughout the day with live music on the main stage that drew downtown visitors to the race and into an expo area where they could view racers as they finished along a fast paved decent. New Belgium Brewing offered several variety’s of draft brews throughout the day in the beer garden welcoming weary racers and fans with malty, hoppy goodness. Defending NUE Race Series Champion, Brenda Simril, Motor Mile Racing, won again this year in her childhood hometown of Big Bear, cheered on by family and friends. Her 6:04:56 finish was nearly a half hour faster than last year. With three straight wins, including the Bailey Hundo and Tatanka, Simril leads the NUE Race Series, needing only one more win to achieve a perfect score and control her destiny in this best four of fourteen race series. 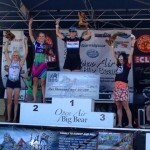 Simril also placed third at the season opener True Grit and second at Mohican MTB100. The only possible hurdle in route to her first NUE Series title will be if another racer can get four wins. If that occurs, The Fool’s Gold 100 in September would serve as a tie breaker to determine the 2015 NUE Series Champion. Just three minutes behind the defending champion, Marlee Dixon, MTBRaceNews.com/Pivot Bikes, claimed second in 6:07:50. Dixon is currently ranked second overall in the NUE point standings. Amanda Nauman, SDG-Bellwether/PB Krema Peanut Butter, took third in 6:41:03. In a close race for fourth and fifth, Nikki Peterson, Bear Valley Bikes, edged out Chase Edwards, Flagstaff Bike Revolution, by just thirty three seconds. Peterson finished 6:44:13. 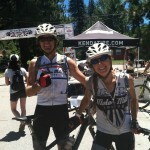 “The Grizzly 100 was a fun, epic, incredibly challenging race. I just started racing mountain bikes in January and have been focusing on cross country so my races are typically 20-25 miles long. In fact, last week I competed in Cat 1 Short Track and Cross Country races in Mammoth, CA where I placed sixth and second, respectively! I did a few 30-40 mile training rides throughout the season but had not done a ride that long. Knowing this, I made sure to go out conservatively so that I could maintain my pace throughout the race. I had issues with my bike the first thirty miles so I used quite a bit more energy than planned. Luckily, I was able to fix my bike with a minor adjustment at the top of Radford and started catching up immediately. By the time we looped back around to the aid station I had caught Chase. At the time I didn’t realize it and I thought that the sixth place woman had caught me. I led her until mile forty where I started bonking. She passed me and was quickly out of my view! The next five miles I did my best to eat and drink so that I could come back to life. After making it down Cabin 89 safely I made the U-turn to head up Pineknot and realized that I actually was feeling good! I passed three riders going up and started turning it over as soon as I got to the fire road. On the finally descent I was out of the saddle. I came around a corner and saw the woman I had been with ten miles earlier! I went by her and kept charging as hard as I could. 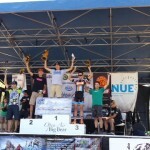 I went by one more rider before crossing the finish line and learned that I ended up fourth! Edwards finished fifth in 6:44:46 “The Grizzly 100 was an awesome race for three BIG reasons: the flowy, fun single track, the long climbs, and the number of ladies–fast ladies–who showed up to race! My favorite part was racing a fast lady through the stellar Skyline trail. At the age of fifteen, she was the final finisher last year, and not long after becoming the 2014 NICA California State Champion. This year, the now 16 year-old Madeline Beamis, Bear Valley Bikes, moved up to sixth place, finishing in 6:57:47 to join the sub-seven hour women. The future of women’s racing is rising fast. Beechan gets the win by less than three minutes! 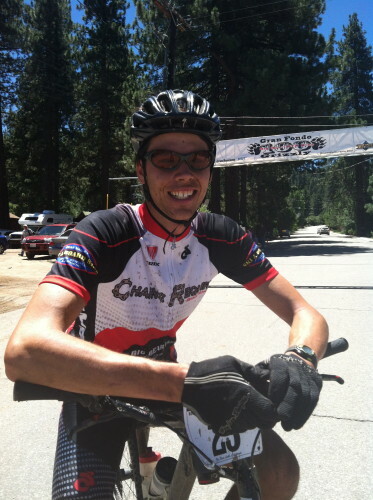 In his first NUE Ultra Endurance race, 24 year old Nic Beechan, Z Racing, from Idyllwild, CA achieved victory in just 5:03:24. 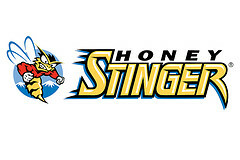 “The race began with 10-15 racers bunched at the front. When we hit the first single track descent, the lead pack whittled down to six through various crashes or mechanical problems. Josh Tostado gained a small lead. At the bottom we began the Front Line fire road climb and I closed in on Tostado having five guys at the lead while riding along the Santa Ana River trail. We played cat and mouse up a small pavement climb section heading into the converse feed station. At the feed station the group stopped, and I saw the opportunity to take the lead on the Radford Road climb. I pulled away and felt strong for the next ten miles, but with fifteen miles yet to go, I began regretting my decision to skip the converse feed station as I began to bonk. I reached the last feed station, filled my bottles, forced down some nutrition, and slowly began feeling better. I continued pushing forward, feeling my competitors closing in. It wasn’t till the top of the Pineknot Trail that I began seeing the light at the end of the tunnel, figuratively, and felt I could retain my lead on the final descent into the finish line. The strongman from Colorado, Josh Tostado, Santa Cruz//Swiftwick, lead early in the race until the Radford Climb, finishing just three minutes behind Beechan to place second in 5:06:14. 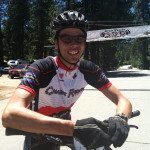 Heading into the race, Tostado was ranked second overall in the NUE point standings with second place finishes at both the High Cascades 100 and the Bailey Hundo. His next appearance at the Pierre’s Hole 100 on August 15 will be critical toward his effort to become the NUE Race Series leader. Seconds behind Tostado, 28 year-old Brian Scarbrough, Spy/Baghouse, from Lakeside, CA claimed third in 5:06:37. Eric Bostrom, Ridebiker/Cannondale, was in the pack of five throughout much of the race finishing four minutes behind Scarbrough in 5:10:03 to place fourth. Three minutes later, Dana Weber, Stage 21, placed fifth in 5:13:38. Last year’s race winner, Julien Bourdevaire, Team Black Star Racing, a native of France, finished in 15th place this year at 5:43:32, well off last year’s winning time of 5:00:43 where he edged out two-time US Olympian and Hall of Fame racer, Tinker Juarez, Ridebiker Alliance, by seconds in the Grizzly 100 NUE debut. LaFramboise crushes the SS Again! Allan “The Rasberry” LaFramboise, Don’s Bikes/Bike for Bender, crushed the SS field once again with a commanding victory in 5:33:58, twenty minutes faster than last year! “Once again, the Big Bear Grizzly 100 did not disappoint! This year’s course stacked up some of the best riders and single track trails in all of SoCal. It included two full sections of the SART (Santa Ana River Trail) and the entire length of the freshly built Skyline Trail. These trails are packed with flowing single track love, twisty turns and incredible 7000+ft views. Right out of the gates the Seven Oaks trail took some riders out of the equation. This was a steep, single track descent that you had to be on your game for. And yes, once again we had to climb the dreaded Radford Jeep Trail to get out of the valley – a 9%, 45 minute incline that left some riders on their knees. Thankfully the aid stations were packed with goodies to help us all keep our hydration and electrolyte levels high. Driz Cook, Big Bear Valley Trails Foundation, was next finishing 5:57:41 for second place. Eighteen minutes behind Cook, Chas Beam, Team Ninja, from San Diego took third in 6:15:58. Andrews is BACK to BACK at Grizzly! 54-year-old Doug “The Hulk” Andrews, Rock N’ Road Cyclery, coming off a second place finish at the Tatanka 100, made a triumphant return at the Grizzly to capture his first victory in the NUE Series this season. Andrews, the 2011 NUE Series Masters Champion, nicknamed the Hulk for a habit of crushing the field by as much as two hours, held a full twenty-one minute lead over second place to finish 5:44:10. Last year, Andrews won following successful surgery and weeks of recovery after suffering from a twisted small intestine earlier in the season that threatened his life. Following his first ever NUE win at Tatanka, 50 year-old Coach Lee Simril, Motor Mile Racing, placed second finishing 6:05:04, further improving his standing in the NUE Point Series. 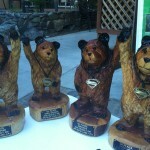 “Big Bear CA is an amazing place with amazing people. Dede, Derek, Tom, and the rest of the staff and volunteers do a professional job of putting on the Grizzly races. During last year’s race Brenda dropped me going up the Radford Road climb and I finished the rest of the race with my sad face on. This year would be a different story, right? I would be super fit and Radford would be no problem, right? Well, this year I hung in on Radford, but it was a problem! For me the best part of the course is the 7 Oaks descent, because it is so unique. It is steep, narrow, loose and always close to the edge. I love this descent. Last year we got caught in traffic and inched our way to the bottom; this year we agreed on riding a little harder to the top in order to have a cleaner run on the downhill. Our plan worked well until about two thirds of the way down when I caught up to Brenda who was slowed by a couple of riders in front of her. This plan of a faster start may or may not have helped our overall race, but it sure made 7 Oaks more fun and is that not what this mountain bike crap is all about? I gave away years of my life to hang onto B during this year’s race, but I knew we were riding fast and this would help me in my placing in the 50 plus category. As it turns out it did help, but there was no dealing with Doug Andrews on this day. I said hello to Doug at the start and at the finish and that was it. He was on fire like that girl with the bow and arrow. The Race Director, Derek, changed the 100k course this year and I believe he nailed it. The new course moved the Radford climb from the end of the course to the middle and added miles of amazing singletrack to the end. Being in Big Bear is good for me. I am not sure what it is about this place but I always want to extend our rides in Big Bear. The weather always seems to be nice and the trails are so convenient to town. We leave B’s parent’s cabin and are on sweet trails within fifteen minutes of neighborhood road riding. One minute behind Simril, 56 year-old Ken Winston, UC Cyclery/JW Floors, from San Diego claimed the third podium spot finishing 6:06:41. Twenty minutes behind Winston, 51 year-old David Strauch, Team Chill Mountain, took fourth in 6:26:51. Six minutes later, 56 year-old David Jolin, Stark Velo, from Belleville, Ohio claimed the fifth and final spot on the podium to finish 6:32:23. This entry was posted in News, Ultra Endurance and tagged grizzly 100, National Ulta Endurance Series, NUE, results by Shannon Boffeli. Bookmark the permalink.